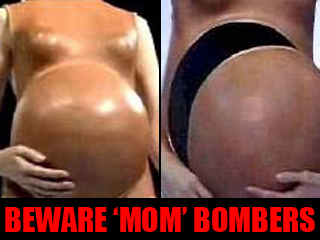 In their latest scare-tactic issuance, the floundering Department of Homeland Security (DHS) and FBI warn terrorists disguised as pregnant women are lurking throughout America with bombs hidden under "pregnant" bellies, Fox (who else?) reported. "See that pregnant lady over there?" Fox's teaser line asked. "The DHS warns she might be the last thing you ever see in your life." Nice. Buried in the report is this admission: "The [FBI/DHS] assessment, which emphasizes that DHS and FBI have no solid evidence indicating imminent homicide bombing attacks on U.S. soil, also reminds law enforcement officials that 'facilities such as public places' are the most vulnerable to homicide bombing attacks and that 'the terrorist's latitude in determining and adjusting the target and timing of an attack up to the point of detonation' make it difficult to prepare countermeasures." So wait a second. There are bombers running loose across America, disguised as pregnant women, but we don't actually have any basis for this sweeping determination? God bless homeland security. "The joint security assessment cited recent female homicide bomber attacks in Baghdad — in which two women who appeared to have Down syndrome delivered a deadly explosion that killed 99 — as well as in Sri Lanka, Chechnya, India, Pakistan and the Palestinian territories as reason for the warning," Fox reported. "'Female suicide bombers may have an advantage over their male counterparts in accessing targets,' the analysis cautioned. 'The means to conduct a suicide attack vary widely, but a key element in maximizing the lethality of a suicide bombing is the bomber's ability to get close to the target.'" The assessment also suggested female homicide bombers might use prosthetics to fake a pregnancy. So next time you're next to a preggie chick on the subway, be sure to duck and cover: Instead of water breaking, you're likely to be hit with "shrapnel, such as nails, bolts, glass fragments, marbles, ball bearings, or other small metal pieces."